Welcome all visitors to the official blog for the Mahallah Talhah Representative Committee session 2011/2012. 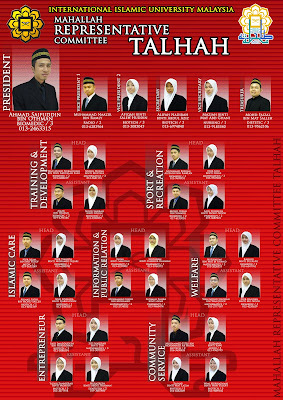 To the people whose faces are on the red chart, please remember that it is an amanah / responsibility to be there. MRC is not merely a 'red carpet' to walk on, nor is it a spotlight to highlight ourselves. Rather, it is the residents' problems and needs that needs to be highlighted, and that job falls upon our shoulders. So, remember, we are "the highlighters". To the people who are looking upon the red chart, know that we will do our best in ensuring that your needs are addressed and taken care of, insya-Allah. And lastly, as a mutual reminder to all, remember that all of us are the same; we are bani Adam. Whether one bani Adam's face is on a red chart or not, that doesn't make the slightest difference. A bani Adam will always be a bani Adam. Coming into this world in the same way, by the painful birth by our mothers, and will leave in the same way, back into the very same clay we are all made of. bgs... ramai muka baru.. ingt.. tggungjawab tu amanah ok..